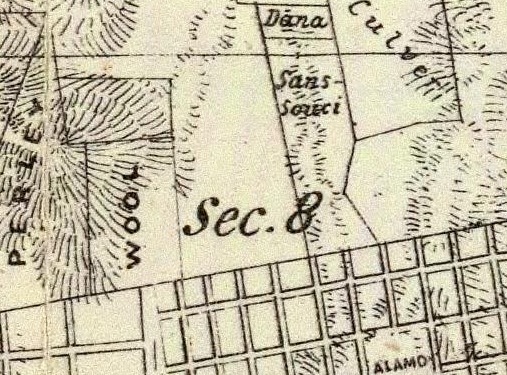 On my tours I almost always refer to the Lower Haight neighborhood and Panhandle area of San Francisco as “San Souci Valley.” That’s the name used until the 1920s or so. I started being curious about it from an old and obviously unreliable map. 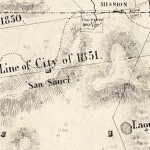 This was the map I saw, showing few buildings, and making "San Souci" look nearly as important as the Mission Dolores itself. Other than misspelled French for "carefree," I had no idea what "San Souci" was. And maps of the time are little help. This is the bizarre story of this little-used old moniker, the maps that make it fun, and discovery—yours and ongoing. Just so you have the context, the streets through the Western Addition and Panhandle areas were graded about 1870, as a result of expansion fueled by the silver boom of the Comstock Load. Before that huge development project, the area was remote and difficult to pass through. It was windy, sandy, and generally tough going for horse or human. North of the east-west dune at Page Street, it was all truly boonies. 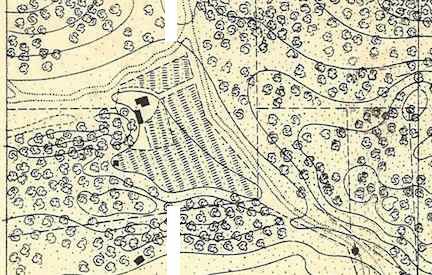 The 1857-59 map shows what was probably an orchard entirely filling the low spot that may have been the lake. The vertical white bars indicate the line of Divisadero Street. But there was one spot of relief. On the line of Divisadero near Hayes, there was probably a triangular lake for a time. 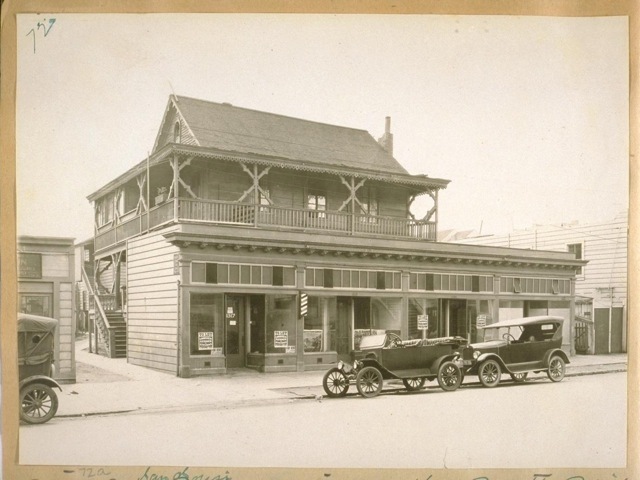 And on its north point, at what’s now Fulton and Divisadero, stood a refuge from the nasty wind: San Souci Roadhouse. 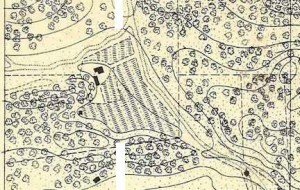 When I first saw a map with a building (image above, right), created in 1853 by SF City Surveyor Clement Humphreys, I was merely confused. Hills marked with the old hatchers instead of contour lines were unclear and locations were inexact. 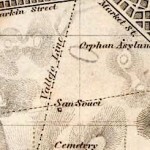 On the 1851 city line (currently Divisadero St.) and on the weaving, dotted line trail from the Mission to the Presidio, stood a building. 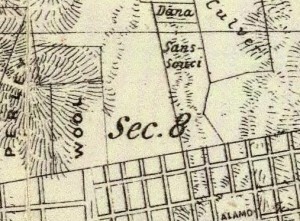 Yet another map (below) from 1861 showed property lines marked with family names, so I thought San Souci could be a name. When I first started the Walk the Wiggle tour, I contacted a local author, Dan San Souci, hoping he’d help clear up the name’s source. He said his family wasn’t old SF stock, and he didn’t have any ideas for my search, though he took a nice photo when he came on my tour. Thanks to the digitization of old library books, I was able to find a reference that explained the San Souci Roadhouse as the source of the name, and then I found a booklet created for Mercy Terrace (the old SP Railroad hospital at Fell and Baker) which detailed the San Souci property. This led me to the California Historical Society’s original copy of a lease from San Souci. I’ll go into that whole angle a lot more in a future post, but I do want to give you one more sweet glimpse of the roadhouse just before it was torn down in the 1920s. Jesse Brown Cook took this photo after other buildings had encroached on the original roadhouse. Storefronts had also been added. If you know of any photos before all these changes, I'd love to hear!